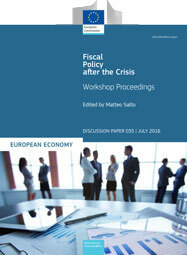 This paper presents the proceedings of the annual Public Finance Workshop organised by the Directorate-General for Economic and Financial Affairs in Brussels on 19 January 2016. Discussion Papers 35. July 2016. Brussels. PDF. 156pp. Tab. Graph. Ann. Bibliogr. Free. Discussion Papers are written by the staff of the Directorate-General for Economic and Financial Affairs, or by experts working in association with them. The Papers are intended to increase awareness of the technical work being done by staff and to seek comments and suggestions for further analysis. The views expressed are the author’s alone and do not necessarily correspond to those of the European Commission.